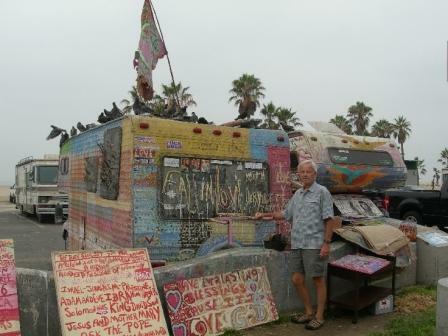 Helen – We walked from our B & B in Marina del Rey to Venice beach (the weird one!) but most of the weird people were still sleeping so we just got to see the youth surf camps and those walking cycling and skating…it was fun. We then drove up the Pacific Coast Highway (Rt 1). We stopped to see Pepperdine University and then continued to Ventura where we had lunch at the harbor and then toured the Channel Islands NP Visitor Center. At 2pm they had a live interactive video with a park ranger SCUBA diving in a Kelp Forest off Anacapa Island – pretty cool! We also visited the San Buenaventura Mission (1782) and hit the thrift stores. 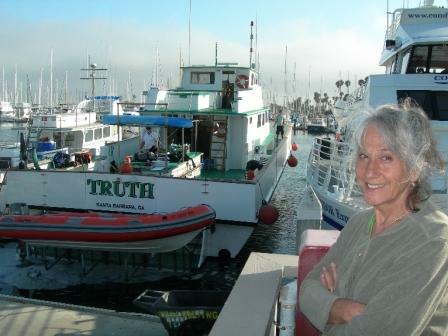 We arrived at the Santa Barbara harbor about 5:30 but had to wait till 8pm to board our boat the “Truth.” We checked in with Paddle Sports of Santa Barbara where I bought a long sleeve Lycra shirt to wear under the sleeveless wetsuit (thank heavens I did!) 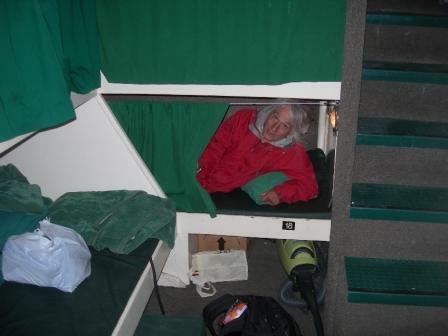 and then had fish dinners at Brophy Bros before walking downtown where they were celebrating “Fiesta.” After boarding the boat we picked out a double bunk, of course I had to sleep against the rounded side of the hull. But I had my revenge when I had to climb over Tom twice during the night to go potty!